WARNING: This blog post ends with a really lame attempt at humor. You’ve been warned. I’m always surprised by the things I miss whenever I’m overseas. When I was 21 and backpacking around the world for a year, it was Old Dutch potato chips (click here if you’re not Canadian). When I was living in xenophobic Dublin from 1999 to 2000, it was Vancouver’s racial tolerance. Now that I’m in South Korea, I miss grass and strong coffee. When I say I miss grass, what I really mean is that I miss all the parks and playing fields that Vancouver and Victoria have. In Vancouver, especially, you don’t have to walk very far to find a nice big patch of grass. This is fantastic if you are the parent of a really energetic little kid like Ian. Back home, it was easy to find places where he could run and run and run until he was all tuckered out. If he fell down a hundred times, it didn’t matter. That soft cushy grass was no danger. And it was easy to keep him well away from cars. South Korea, by contrast, is unfortunately not greatly endowed when it comes to parks and playing fields. This is pretty understandable when you consider the twin facts of its small geographical size and relatively large population. South Korea is about the size of Portugal, but seventy per cent of the country is covered by mountains. This means that 46 million South Koreans and all the factories, farms, shops, roads, military bases, etc. are squeezed into a very small area. In a country this cramped, it’s no wonder there are nowhere near the number of parks and fields we take for granted back home. The lawn in front of the in-laws' house is nice, but our little guy needs a lot more space than just this. Coffee is another thing I miss – strong coffee. KJ and I are on a constant search for a nice French or Italian roast, but so far we have had no success. We’ve tried many of the cool little independent coffee shops, as well as the chains with interesting names such as “Angel in Us”. We’ve even tried Starbucks. You would think Starbucks in South Korea would offer a nice strong cup of coffee, but no. The strongest they’ve got here is what would pass for a medium roast back home. So there you have it. Those are the two things I miss. 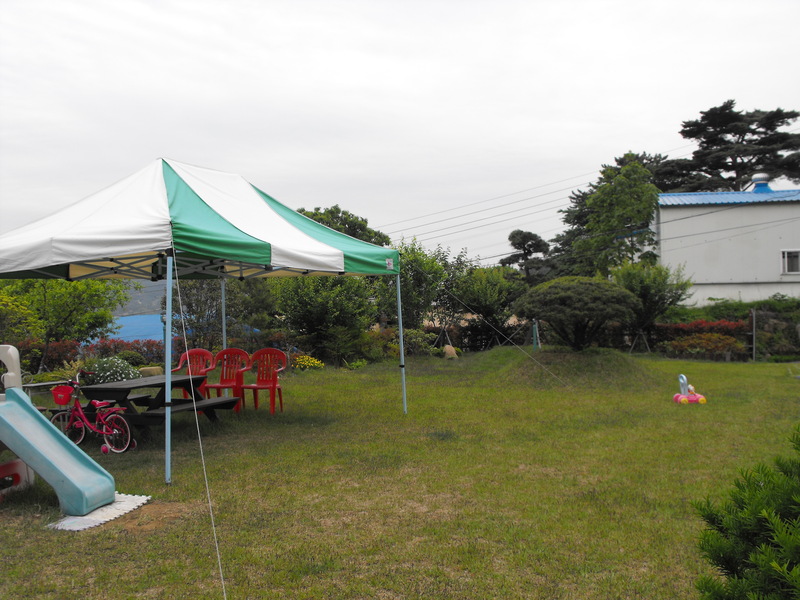 For the reasons mentioned above, I can accept the paucity of parks and playing fields in South Korea. I wish it weren’t so, but I can accept it. However, the total lack of strong coffee is not acceptable. I know the South Korean government has more pressing matters to attend to at present, but I do hope they will address this situation as soon as they have the time. There are quite simply no grounds for weak coffee.